In Celebration of Irish Heritage Month... My "Circle of Friends"
I grew up with the expression "everyone is Irish on St. Patrick's Day." And I, of course, always wore green. Over the years, I have learned that I actually am a wee bit Irish. My wife, who is African-American, had a maternal grandfather who was a red-haired, blue-eyed man named Hugh Kelly McKee. So, the Irish is one thread we share. Three of my favorite authors are Irish. Two are poets and Nobel laureates for Literature: the amazing Seamus Heaney and the iconic William Butler Yeats. For students of great literature, I agree that my third favorite Irish writer is not in the same league as Heaney and Yeats, but I love the work of Maeve Binchy, who died in 2012. Like many Americans, I became familiar with Maeve Binchy when her bestselling novel, Circle of Friends, became a popular movie. Another of her novels, Tara Road, was an Oprah selection. Maeve Binchy was a contemporary novelist, short story writer, and journalist. For many years, she was a columnist for the Irish Times. My favorite short story of all time is Dinner at Donny Brook from the collection of short stories The Lilac Bus. What Binchy really captures are the rituals and minutiae of life in Ireland. In her novels, it’s not so much the story that commands attention, but the characters who come to life. Her books brought the Emerald Isle to life for me, and over the years, I have read all of her books and have shared them with my daughter Toni. In the Deep Heart's Core has a special meaning for me with these three writers, Binchy, Heaney and Yeats, because their literature touches my soul and takes me deep into my heart's core. 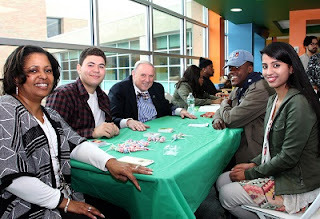 On March 14, President Wood and senior administrators Dr. Susan Deer and Dana Stilley participated with RCC students in an event, Game of Winners, organized by Student Involvement. The goal of the event was to build partnerships between students and members of the College's executive team. The President and senior administrators became engrossed in board games while building a network of support among students. More than 50 diverse students participated, and more than 100 engaged spectators waited their turn to play Scrabble, Uno, Scattergories, Connect Four and other games in a friendly, non-threatening atmosphere. On Saturday, February 27, the celebration of the most recent graduates of the PFC Joseph P. Dwyer Veterans Peer Counseling Program was held in the RCC Veterans' Lounge. The accredited 15-hour program trains people to be effective mentors and provide counseling for veterans suffering the effects of PTSD and other related issues. This is the second time the course has been hosted at RCC. Alumnus Jaime Sosa ’07, and Gerard Vitale, Admissions were in this graduating class and previous graduates include Coordinator of Veterans Affairs, Jonathan Barnwell, ’77 and alumna Beth Robinson, RCC ’78 and currently Assistant Professor and chair of Communication Media Arts at RCC. 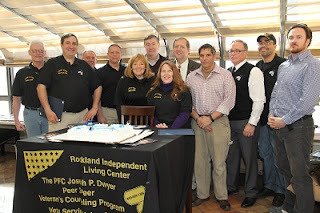 This important program is being offered under the auspices of the Rockland County Independent Living Council.